Update: please also read my latest analysis here. As I did more research some of my ideas have changed so I will update this article in the near future! A housing bubble occurs when real estate prices rapidly rise above what is supported by fundamentals and then quickly fall to a normal level. 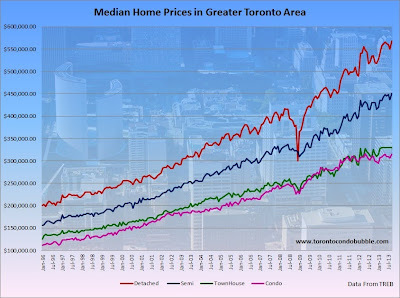 If you were to map a trend line for the average price of a home in the GTA, you would see that current prices are about 16% above the 30 year average. But drawing conclusions based on a trend line alone is foolish. You have to look at other fundamentals such as income growth, household indebtedness and price-to-rent ratios in order to see the full picture. And that's exactly what I've done. After analyzing the numbers, I've come to the conclusion that real estate in Toronto is overvalued at least 20% (in real terms). And it's not only condos that are overvalued but the detached homes as well. In fact during the brief housing crash in 2008, freestanding homes experienced the worst declines in value. Now, telling you my prediction is easy enough but showing you how I came to this conclusion is little more complicated - so bear with me. Let's first start by turning back the clock and revisiting 1989. Whether you knew it or not, there was a huge real estate bubble in the mid to late '80s. Prices went up by more than 100% in less than five years and then crashed by 40% over a period of seven years. 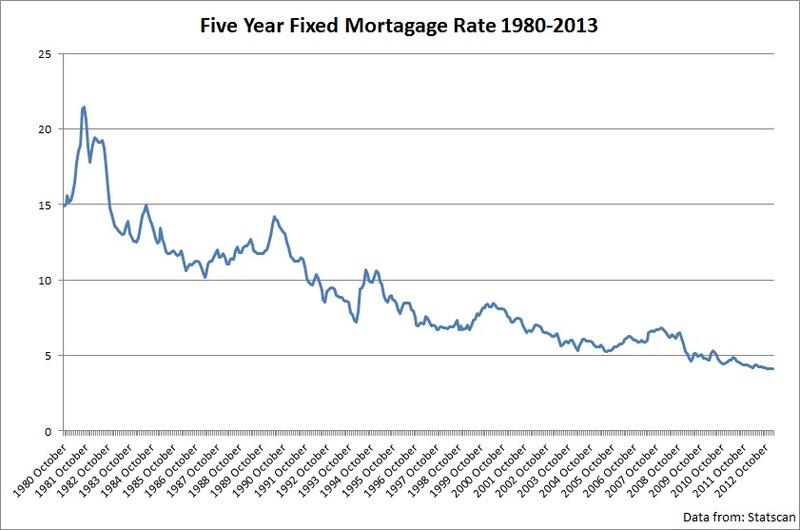 In the '80s, interest rates were north of 10% and so was the minimum down payment. The 5% down payment was introduced in 1992 as a trial and officially accepted only in 1999. Needless to say, if you think that poor lending standards are necessary for a housing bubble to occur, you are wrong. In fact, the key lesson from the last real estate bubble in Toronto is that you do not need to have low interest rates or sub prime lending standards for a bubble to occur. 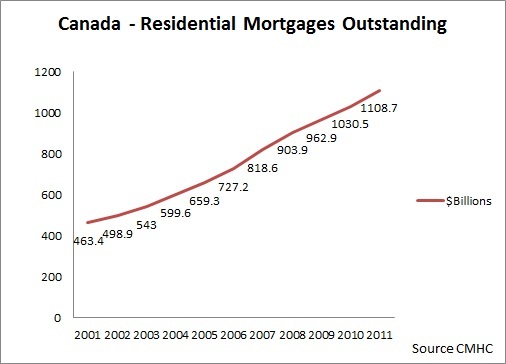 Nevertheless, Canada still had bad lending habits over the past decade, but more on that later. I often hear from homeowners who say that real estate is local - they tell me that they live in a great neighborhood and prices will not go down in their area. Sorry guys, but you're living in a fantasy land: when the market goes south, it affects everyone. It's just a matter of the degree. As you can see, downtown prices declined by whopping 50% (adjusted for inflation) in seven years. (Map created using following sources: pdf1, pdf2, and adjusted for inflation via inflation calculator. 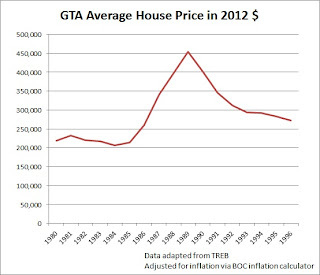 So how do you compare the housing bubble of late '80s to the present bubble in Toronto? Many people believe that because interest rates were north of 10% in the '80s and today they are below 3%, home prices are affordable in the GTA and thus there is no housing bubble at all. What you should know is that affordability indexes, such as the one by RBC, tend to mask the underlying home price overvaluation due to the low interest rates. In his report on the Canadian housing bubble, Alexandre Pestov proved that if you equalize the interest rates, housing in Toronto would be just as unaffordable today as it was in the '80s. When you account for inflation, the average house price in the GTA is 14.4% above the peak reached during the late '80s. Does this mean that the current bubble is larger than it was 24 years ago? Not really, as you have to keep in mind the time scale. During '80s bubble, housing prices doubled in less than five years. 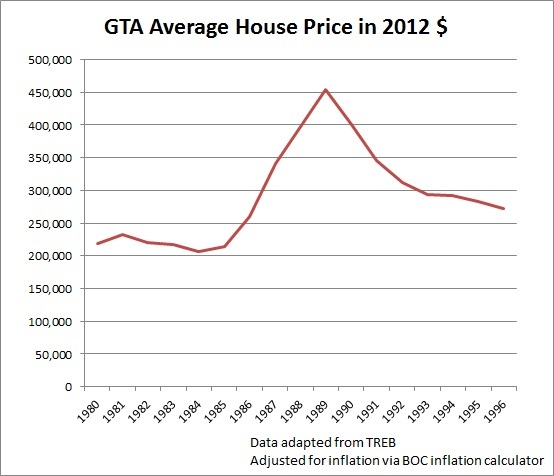 When prices bottomed in 1996, the average house price in the GTA was still about a third higher than it was in 1985. Why is that? Well, a few things changed - the population increased, land became more scarce, and incomes grew. Similarly, some of the price growth today is justified by increasing population and more restrictive land policies such as the Greenbelt. Prices won't fall back to 1996 level. 1954-1990- Somewhere along this time, 10% became minimum down payment. 1992- 5% was introduced as a trial run, then officially accepted in 1999. 2001 – CIBC offered below-prime mortgages. Sep 2003 – CMHC: 5% down, 25 yr amortizations, removed all price ceiling limitations. Now any mortgage would be insured regardless of the cost. Oct 2008 – CMHC: 5% down, 35 yr amortizations, investors need 5% down. April 2010- CMHC did some minor tightening of their guidelines, investors need 20% down. Due to the CMHC relaxing mortgage rules from 1999 through 2006, we saw dramatic price increases. If there were no 30, 35 and 40 year mortgages and the down-payment was kept at 10%, one could assume that the prices would still be below the 1989 peak. Some argue that it was the availability of credit that caused the rise in housing prices and not the low interest rates. Specifically, in 2003 the $250,000 insured mortgage maximum was removed by CMHC. For the next nine years CMHC insured mortgages of any value. Only in 2012, CMHC restored the insured mortgage maximum at $1 million maximum. That is still to high however. Imagine if CMHC restored the original $250,000 (if you adjust for inflation in 2013 it would be $300,000) limit what that would do to the housing prices. The average home price in Canada as of July 2013 is $386,585. After the housing crash in the United States, it seems that the Canadian government realized what they had done. So starting in 2008, they began reversing the changes made to the amortization rules. 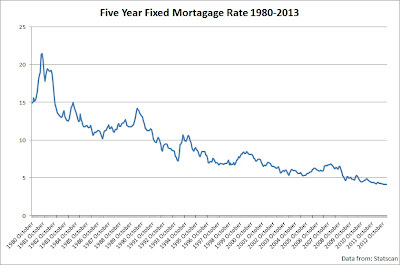 But even after killing the 40, the 35 and finally the 30 year mortgages, the prices still kept going up. Why? Record low interest rates. In fact, all growth from 2009 through 2013 can be attributed mostly to the record low borrowing costs. People started to believe that this is a generational opportunity to buy - when in fact it was a bear trap. 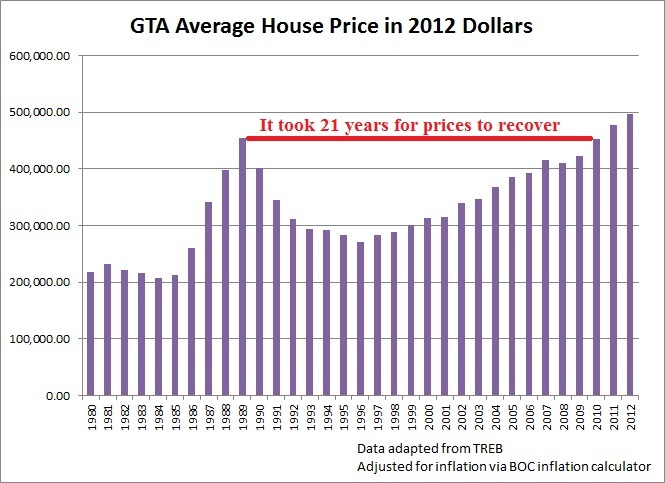 In my opinion, and when adjusted for inflation, housing prices in Toronto will return to the 2008 levels at the minimum. Prices were already overvalued back in 2008, and then they increased another 30% over the next five years. For that exact reason it is my prediction that prices will drop anywhere between 20% and 30% depending on the area. All this housing price growth is phony. Prices did not increase because we make substantially more money today. The growth was artificial due to the government tinkering with the mortgage rules, and the emergency interest rates (which, by the way, are pretty much still in place today). As prices kept going up and more people qualified to purchase a home, society was led to believe that prices always go up and that you can actually make a living by flipping houses. At the same time, Canadians ignored the housing meltdown in the USA and truly believed that we were different. Our banking system is greatest in the world and we are a resources exporter and thus we are unique and different... right? The truth is, Canada is no different and is governed by the same fundamentals as the rest of the world. Canadians did not get richer. While Scotia Bank likes to tell you that "You're richer than you think", one wiseman from Toronto once said it much better: "We've leveraged you more than you think". The correlation coefficient between the debt-to-income ratio and the national teranet index is a staggering 0.98, or in other words, almost perfect. The debt-to-income ratio currently stands at a record level of 164.7% - meaning that Canadians are stretched to the limit. Saying that housing prices will continue to rise is foolish. If prices keep going up, that will mean a further increase of household debt. 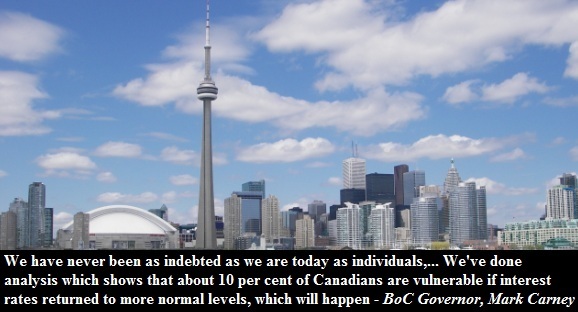 The Bank of Canada already estimates that 10% of Canadians are vulnerable to higher interest rates. And the more debt we accumulate, the more vulnerable we make ourselves. The sooner we pay back our debts the better. In 2011, Mark Carney said this: "Canadians have now collectively run a net financial deficit for more than a decade, in effect, demanding funds from the rest of the economy, rather than providing them, as had been the case since the Leafs last won the Cup." Let me translate the last sentence for you: we have been living beyond our means for more than a decade. If you divide the selling price of a condo or home by its yearly rent you would arrive at the price-to-rent ratio. If the ratio is between 1 and 15, that indicates that it is much better for you to buy the place, rather than rent. If it is between 16 and 20, that means that it is better for you to rent the place, rather than buy. Finally, if the ratio is above 20, that means that is much better to rent. Above is a chart produced by the IMF. As you can see, Toronto had a price-to-rent ratio of 37 in 2010. The price-to-rent ratio was at 30 and then it dropped to around 21 by 1996. Look where it was in 2010, at 37, and in 2013 it is probably past 40. 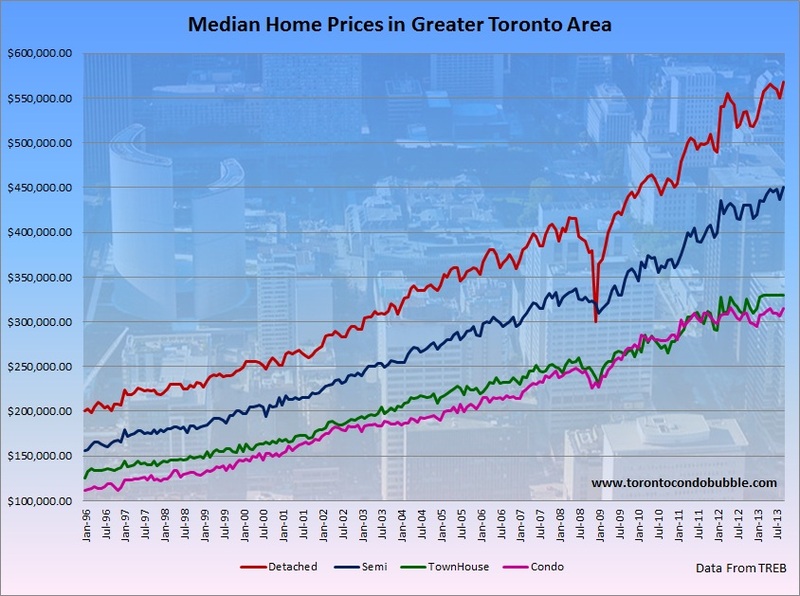 From the price-to-rent perspective the message is clear: Toronto is in a housing bubble. Recently the IMF published another update on the Canadian housing market, and below is a chart which shows that Canada is about 60% above its historic price-to-rent ratio. Now look at the US, which recently had its housing bubble burst, and finally look at Japan which had its bubble burst back in the late '80s. 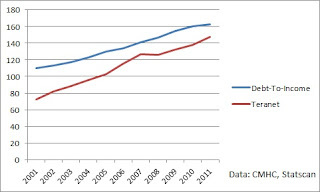 The chart below shows the Canadian price-to-rent ratio between 2000 and 2012. Notice the dip in 2008 and how quickly the ratio went back up. While the US ratio was going down, Canadians were convinced that they were different and thought that high real estate prices were justified in their country, so the ratio and the prices went back up. Comparatively speaking, rents are too cheap and houses are too expensive in this country. This will correct itself - as it always does. The price-to-rent ratio will return to the mean and so will the housing prices. Historically speaking, the average house should cost about three times your annual salary. If it costs less than three years worth of your salary then it is considered affordable. If it costs more than three years worth of your salary, then it is unaffordable. According to Demographia, if the house costs more than five years of your annual salary then your house is severely unaffordable. The price-to-income ratio for a city or a nation can be calculated when you divide a median house price by median household income. 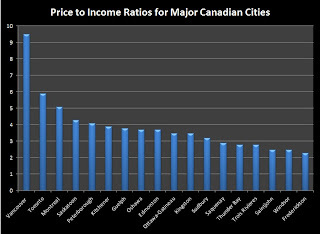 Below is a chart which compares national price-to-income ratios in the USA and Canada. 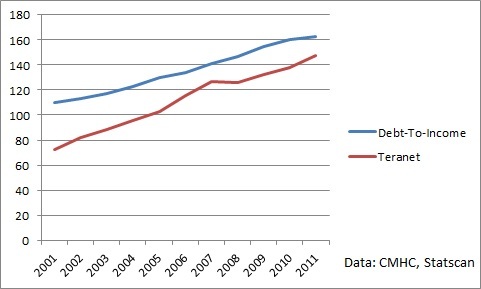 Looking from the price-to-income perspective, the Canadian housing bubble exceeds the severity of the United States bubble in 2006. The current price-to-income ratio in Canada is unsustainable and the ratio will return to the mean, which is 20% below the present value. I think Garth Turner is correct with his prognosis of a 15% correction nationwide - and that he may even be too conservative. 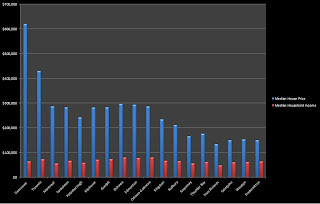 Let's turn our attention to the local markets and look at the individual Canadian cities. 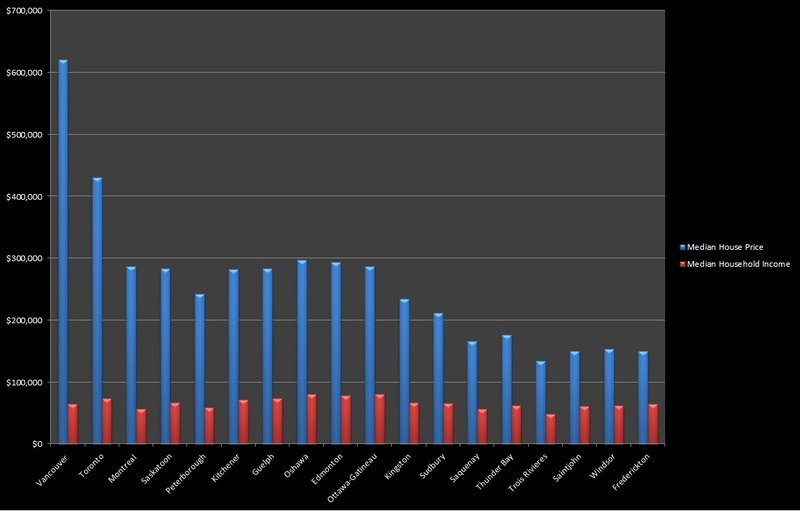 In the first chart below, you can see the median house price versus the median household income in major Canadian cities. The second graph below maps the actual price-to-income ratios. Remember, anything below 3 means affordable, above 3.1 unaffordable, above 4.1 seriously unaffordable and above 5 severely unaffordable. 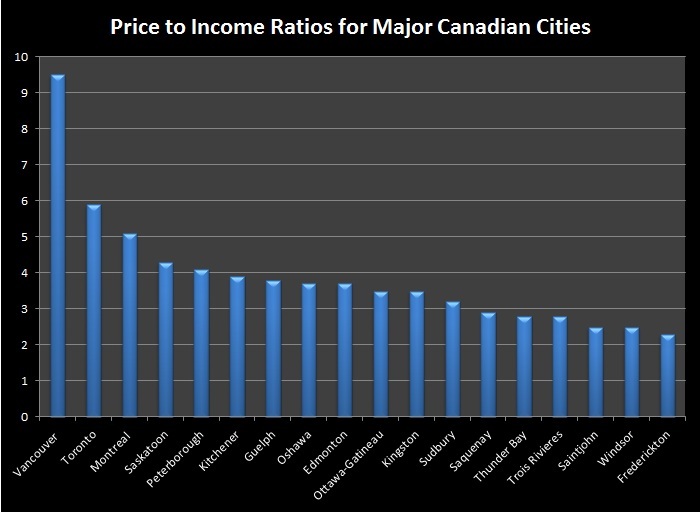 After looking at the last chart, some may argue that beautiful cities like Vancouver or Toronto deserve to be more expensive than places like Guelph or Thunder Bay. After all, everybody wants to live in Toronto or Vancouver... right? On top of that, people want to live in nice neighborhoods such as Forest Hill or Yorkville. People who tend to live in those places also tend to make more money in order to afford such places. 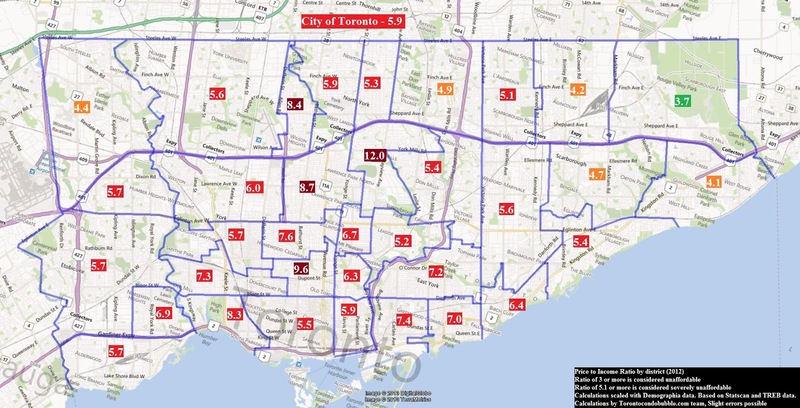 Below I created a price-to-income map for the City of Toronto. The housing prices are based on the 2012 TREB numbers, while the area income was calculated individually for each CMA area. I would say that my map is on the conservative side as I assumed 40% income growth from 2005. The pattern is clear: the more expensive the neighborhood, the higher the price-to-income ratio. People who make the most money leverage themselves the most. Yorkville and Forest Hill have some of the highest price-to-income ratios in the city. Some even say that the high price-to-income ratios in these cities demonstrate their class. But others have different views about it. For instance, American economist Robert Shiller believes that the more wonderful a city is, and the more glamour it has, the higher the chances that city will experience a bubble. It already happened once before in Toronto, and now it is happening again. Robert Shiller became one of the most influential mainstream economists in the world after he predicted the housing crash in the United States. In an interview back in 2012, he called Canada's real estate market a bubble. Shiller compared Vancouver to California (which experienced more than a 40% crash) and Toronto to Boston (where prices have corrected by 30%). The above graph doesn't look too dramatic, but Shiller explained that while Toronto's housing prices have risen slowly and steadily, they still rose by a lot. 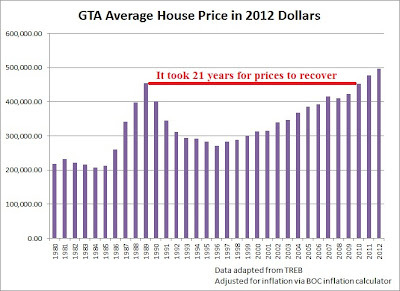 Between 1998 and 2012 Toronto's prices went up by 72% when adjusted for inflation. Shiller believes that Toronto can correct as much as Boston did - even though Toronto is Canada's financial center. Finally, Shiller also mentioned that he wouldn't buy a condo in either in Toronto or Vancouver. In his opinion, condos tend to be too volatile. BMO, IMF, Fitch, The Economist, Carney and TD all expect a reverse in the Canadian real estate market in Canada. Below is a summary of their doom and gloom predictions. Hong Kong, Tokyo and London were also running out of land until their bubbles burst. Land scarcity does play a role in rising housing prices, and this is one of the reasons why the '80s bubble bottomed 30% above where it started. The real fundamentals that drive up the cost of real estate are higher wages, credit and inflation. Actually, it is the other way around. The most recent example of this is the United States. They had a recession and high unemployment in the aftermath of the housing bust. Here is an awesome article by Ben Rabidoux which shows that the economy goes the same way as housing. It's true that you can profit with real estate, yet as Shiller showed, over a long enough time period, housing prices follow inflation, incomes and the GDP. Phoenix also experienced huge inflows of people during its housing bubble. Yet, even with people moving into the city, prices still crashed. Likewise during '80s bubble - people were moving into the city until it burst. Once the housing market crashes Canada-wide, and the GDP growth slows or even goes negative, expect less immigrants coming into the country. In fact, rapidly rising population facilitates the development of a housing bubble. Low vacancy rate has nothing, absolutely nothing, to do of whether there is a housing bubble or not. Look during the last housing bubble in Toronto, the rental vacancy rate was almost zero. The rental vacancy in Toronto between 1985 and 1985 was below 0.3%. 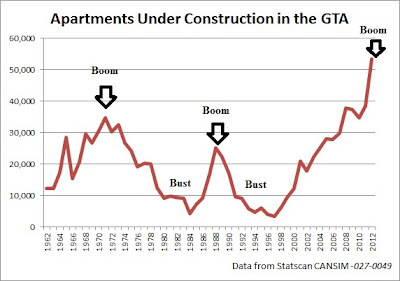 So even while vacancy rate in Toronto was super low, Toronto was in a midst of a giant housing bubble! 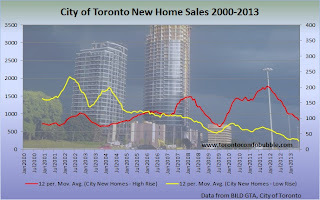 For the latest market update on Toronto's real estate, click here. 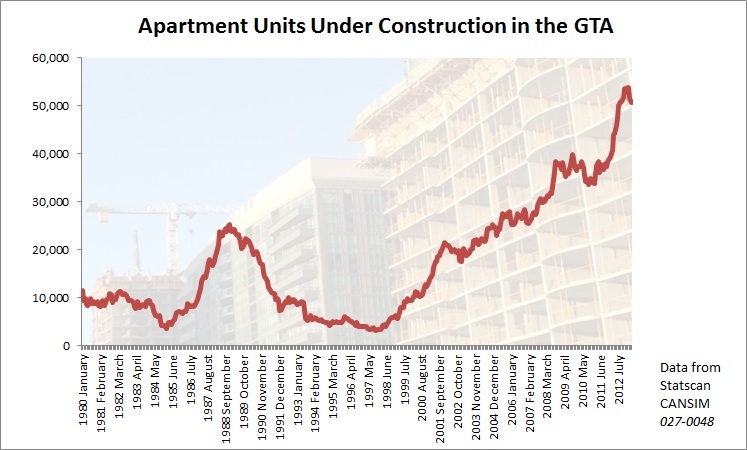 As of March 2013, there are 51,236 condo apartments being build in Toronto according to CMHC. 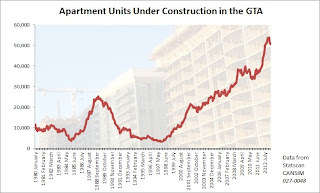 Toronto condo bubble in reality is more of a construction bubble than anything else! In a construction industry there is always a period of a boom and a bust. Just look at the following chart! Oh and by the way, Toronto is building more apartment towers than anywhere else in the North America! We are at the top of the bubble right now from the price perspective. From the sales perspective, the bubble has burst. 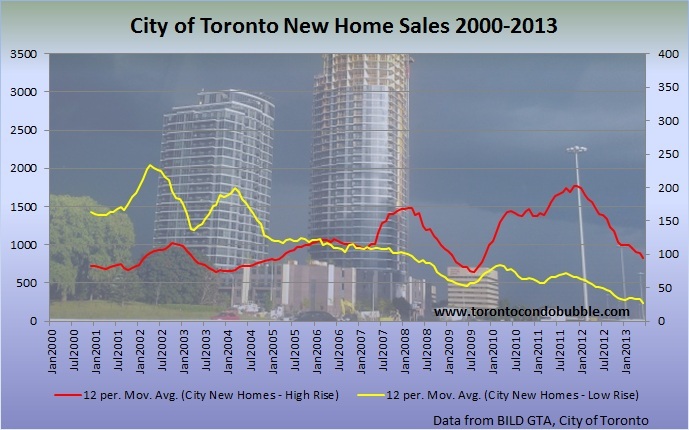 For example, in 2012 new condo sales have crashed by 43%. In a few years there will be barely any cranes on Toronto's skyline. Nationally the sales are down by over 15% and they continue to fall. Remember: sales fall first, prices fall second. Additionally, judging from the US, prices can be in flux (sideways) for more than a year before they start falling dramatically. If you are wondering why the prices keep going up even thought the sales have declined please read my detailed explanation here. The short answer is that sales fall first, and prices usually begin to decline a year or so later! 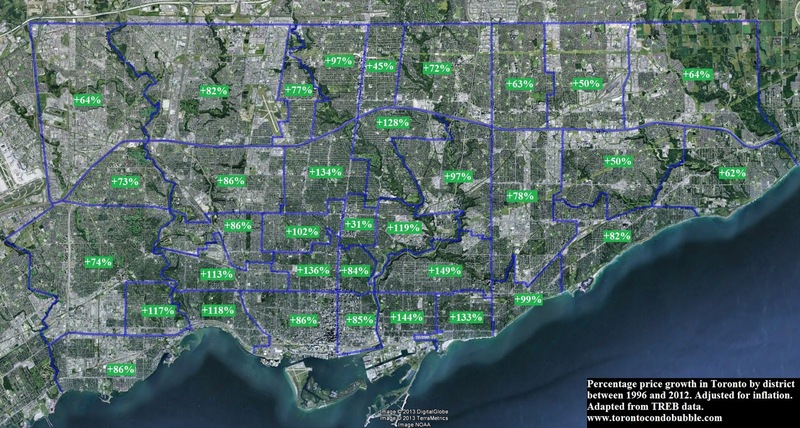 Below is map that shows how much housing prices went up from 1996 to 2012. Keep in mind that these stats were adjusted for inflation so the numbers are lower than you might expect. Notice the areas that have experienced the biggest price growth. Those areas tend to be the wealthiest and most glamourous - such as The Beaches, Yorkville, and Forest Hill. For more maps like the one above, click here. In my opinion, Toronto housing market overall is overvalued by at least 20% in real terms, but what does this mean for the individual person - for you? - If you plan to invest in real estate, right now is the worst possible time to do it. - If you own an investment property and your strategy was based on 6% annual appreciation, then you better grab a calculator and consider selling as soon as possible. - If you are a first time home buyer with a 5% down payment, just rent! - In any case, you better do some math with various scenarios before jumping into the market. Finally, if you are currently house horny and in need of therapy, I highly suggest you read Garth Turner's Blog. 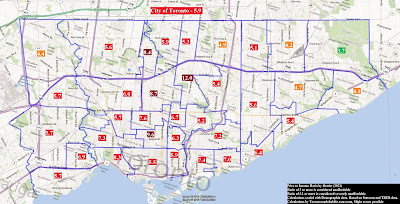 If you are a statistics geek and you want to discover all the tiny bits of information about Toronto's housing market, read Ben Rabidoux's blog. And, of course, don't forget to come back to the Toronto Condo Bubble for the latest news on the Toronto housing bubble. Note: this article is frequently updated, with errors corrected and changes in opinion as the situation develops!